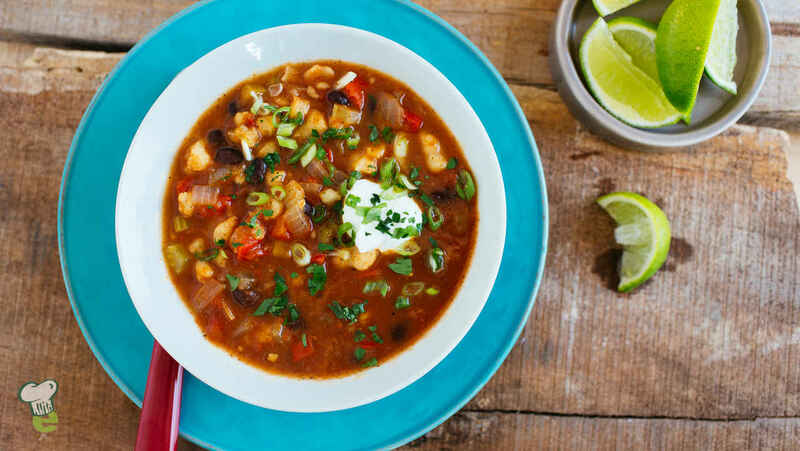 This hearty vegetarian chili is made with hominy, a staple in Mexican cuisine. Hominy is dried corn that is used in Mexico to make tortillas. In the U.S., it is often used to make grits. You can find canned hominy in your local supermarket. In a large saucepan, heat the oil over medium-high heat. Add the onion, celery, bell pepper and garlic and sauté until onion softens, about 10 minutes. Mix in chili powder, cumin, cayenne and oregano and stir for 2 minutes. Add the beans, tomatoes, broth, water and hominy. Bring chili to a boil, stirring occasionally. Reduce heat to medium low and simmer until flavors blend and chili thickens, stirring occasionally, about 15 minutes. Add cornmeal if desired thickness is not achieved and cook 10 minutes more. Season with salt and black pepper to taste. Serve garnished with Greek yogurt, cilantro, scallion and lime wedges, if desired.